I must express my gratitude to the many hon. Members who, in the course of this debate, have spoken generously about the policy that the Government has pursued in regard to the State of Jammu and Kashmir. While we have had an abundance of generous acknowledgement of our policy, we have had criticism also. I welcome the latter, because it is always helpful in understanding a particular position. In this very difficult and delicate matter, criticism will be especially helpful, because the more aspects we examine the more light will be thrown upon the problem. We have dealt with this matter for nearly five years now. We have fought on the battlefield for over a year and many of our brave young men have gone to Kashmir and remained there. We have fought this fight in many a Chancellery of the World and in the United Nations; but above all, we have fought this fight in human hearts-the hearts of the men and women of the State of Jammu and Kashmir. With all deference to this Parliament, I would like to say that the ultimate decision will be made in the minds and hearts of the men and women of Kashmir and not in this Parliament or at the United Nations. We have dealt with the problem of Kashmir in a variety of ways in various fields of action. 'We have not, however, solved it, although we have made progress in a particular direction. I want to be perfectly frank with this House and promise no speedy solution. Why should I make promises which I might not be able to keep? And may I remind this House that there are numerous problems today, big problems, affecting the world's future which remains unsolved, which drag on from month to month and year to year without solution? One has to be thankful if these problems do not grow worse. That itself is supposed to be a great mercy and a blessing. It is all very well for people in foreign countries to say, 'Why don't you solve this question of Kashmir? It may lead to big things, perhaps, to a world conflict.' Many people in foreign countries are generous with their advice. One feels tempted to tell them that they also have vital problems to solve, whether it is in the Far East or in Europe or elsewhere and that their problems also some­how drag on from year to year. Why do they not find a solution to these before offering advice to us? How is it that we are at fault because we cannot solve the question of Kashmir while they, who censure us, are above reproach, though they fail to solve their problems? Not only do their problems remain unsolved but preparations are also made to create problems for the future. Anyhow, this would be a cheap reply for us to make to them, because we are all in difficulties; we are all struggling against things which, perhaps, are not entirely within the control of anyone country or any one people. I should like this House to continue to consider this problem as it has been considered in the past, that is, in all its aspects, forgetting for the moment the minor things, the lawyer's points if I may so call them with all respect to lawyers. The latter certainly have their place, provided they keep it. My honourable friend, Dr Mookerjee, has said a great deal about this clause and that clause. If I have the time I shall deal with the points he has raised but it is of little importance what this clause or that clause says. What is important is the way you approach the problem and its fundamental basis. It is also important what your objective really is and how you propose to gain it. If it is your objective - as I shall claim it should be, for there can be no other - ­that this problem must be decided by the people of Kashmir then you must adopt a policy by which that end can be gained. Why issue threats? Why talk to them and tell them they must do this or must not do that? I am called a Kashmiri in the sense that ten generations ago my people came down from Kashmir to India. That is not the bond I have in mind when I think of Kashmir but other bonds which have tied us much closer. These bonds have grown much more in the last five years or so. When I talk of my ties with Kashmir, I am only a symbol of the vast number of people in India who have been bound together with Kashmir in these five years of conflict against a common adversary. First of all, let me say clearly that we accept the basic proposition that the future of Kashmir is going to be decided finally by the goodwill and pleasure of her people. The goodwill and pleasure of this Parliament is of no importance in this matter, not because this Parliament does not have the strength to decide the question of Kashmir but because any kind of imposition would be against the principles that the Parliament upholds. Having come to the conclusion that the future of Jammu and Kashmir State can ultimately be decided only by the people of Jammu and Kashmir, let us fashion our other policies accordingly and let us not find fault with every little thing because it does not fit in with our wishes. Many things have happened in Jammu and Kashmir which I do not approve of; but there it is. I have no doubt many things have happened and will happen that neither my honourable friend on the Opposite side of the House nor I will approve of, just as many things happen in the rest of India that I do not approve of. I do not control everything that happens in India. But what is our approach going to be? Whatever it is, we must not do anything which will counter it or under­mine it or uproot it and which will encourage the hands of those who are opposed to us-our enemies. That is the basic thing which we must understand. Let us be clear about it. You can criticize Sheikh Abdullah. Sheikh Abdullah is no god. He commits many errors and will commit many more. He is a brave man and a great leader of his people. That is a big enough thing. He has led his people through weal and woe and he has led them when they were facing grave disaster. He did not shrink from leadership at that time that is a big enough thing to be said about any man. If he has failings, if he has made a mistake here and there, if he has delivered a speech which we do not like, what of that? Bigness is bigness in spite of a hundred mistakes. And in any case, the question is not whether we like Sheikh Abdullah or not. It is a bigger matter than any individual. The question of Kashmir, as this House well knows, certainly has not been for us a question of territory. Finan­cially, we gain nothing from it. On the contrary, it may cost us a good deal until the State ultimately develops; and it is bound to develop because it is rich in resources. Nevertheless, we have not cast covetous eyes upon Kashmir or hoped for any gain. We have cast eyes on Kashmir because of old bonds, because of old sentiments and new sentiments also Kashmir is very close to our mind~ and hearts and if by some decree or adverse fortune Kashmir ceases to be a part of India, it will be a wrench and a pain and torment for us. If, however, the people of Kashmir do not wish to remain with us, let them go by all means; we will not keep them against their will, however painful it may be to us. That is the policy that India will pursue and it is precisely because India stands for such a policy that people will not leave her. People will cleave to her and come to her. Our strongest bonds with Kashmir are not those that are retained by our Army or even by our Constitution to which so much reference has been made but those of love and affection and under­standing and they are stronger than the Constitution or laws or armies. Many of the arguments that some hon. Members of the Opposition have advanced seem to me to be inapplicable. It is easy to criticize many things that have happened in Kashmir. It is natural that one should want to better certain things but that is a different matter altogether. The question is whether in doing so you are coming nearer your aim or being an obstacle in the way of your very objective. The hon. Member who spoke last is a representative-much more so than I am-of a minority community of Srinagar, the Kashmiri pandits. He gave you a graphic account of the days when everybody in the Valley of Kashmir-Muslim or Hindu but more especially the Hindus and the Sikhs ­lived in terror of what the morrow might bring. Nobody knew what would happen or, perhaps, they knew too well. The people of Kashmir, especially the women of Kashmir, have a great reputation outside Kashmir also. The women of Kashmir, both Hindu and Muslim, were taken away in considerable number by the raiders and others, sometimes as far as Afghanistan and even beyond. There are cases where these women were sold for a mere pittance. Hon. Members should try to understand how these stories and these accounts must have affected the people of Kashmir, how they must have lived in fear lest their own mothers, sisters and wives should suffer a similar fate on the morrow. It must be recognized that the people of Kashmir have lived through fire and have faced it; they did not run away from it. Looking back at these five years, I think that the people of Kashmir, the people of India and, if I may say so with all humility, the Government of India have stuck to the right path in spite of numerous small mistakes that they may have made. We have pursued the policy we considered right even when it appeared most inopportune; sometimes our attitude displeased certain people; sometimes a little swerving to the right or to the left would have gained us an advantage in foreign countries-and foreign countries had begun to count for us. It did not matter much what we thought of them; but there they were, sitting in the Security Council and talking a great deal. Sometimes they talked sense; at others they did not. We had to put up with their attempts to judge us and to judge something which was so important to us. Kashmir was not important to us because of any territorial designs on our part as somebody suggested but for the other reasons that I have mentioned. 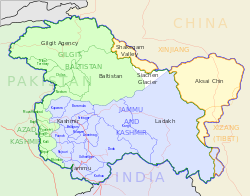 People in other countries thought of Kashmir merely as a geographical unit. It was only a plaything for them while it was very much in our hearts. Our history and our circumstances had made Kashmir so closely associated with our feelings, emotions, thoughts and passions that it was a part of our beings. Certain foreign countries tried to deal with the Kashmir question in a casual way and talked of India's imperialism and her territorial designs. We restrained ourselves but very often there was anger in our hearts-anger at this intolerant criticism, at the presumptuous way in which people talked to us, to this great country of India. They had the audacity to talk of imperialism to us when they were imperialists themselves and were carrying on their own wars and themselves preparing for future wars. Just because India tried to protect Kashmir from territorial invasion, people had the temerity to talk of India's imperialism! Well, as I said, we restrained ourselves and we shall still endeavour to restrain ourselves in future but restraint does no~ mean weakness. It does not mean giving in. We were firm and convinced of the rightness of our position because, as I said-and I said it in all honesty-I have searched my heart and looked into every single step I have taken in the matter of Kashmir but cannot find that any of the major steps we have taken has been wrong. Although it is my Government that is ultimately responsible for the part India has played, I have been personally concerned with every single step taken during the last five years. Of course, in retrospect, there are things that I could have done differently -some minor things-but I do not see how any major step we have taken could have been taken in a way other than in which it was done. When we sent our young men flying over the mountains to Kashmir at the end of October 1947, there may have been a miscalculation; but it was fundamentally a right step demanded by circumstances. We may have erred sometimes because we were anxious to preserve peace and to avoid war at all costs; but I would always like to err in that way. For people to accuse us of avarice or covetousness, of imperialism, of breaking our word and pledge, is grossly unfair. I have said before and I repeat that every single step we have taken has had conviction behind it, every single word or pledge we have given to the United Nations or to the United Nations Commission or to anybody else who has come here has been kept to the letter and every single assurance has been carried out. All this is much more than can be said for Pakistan in this matter, because the entire Kashmir business is based on a fundamental lie-the lie Pakistan has told in denying that she invaded Kashmir. If Pakistan wants Kashmir, let her go there and fight. But why lie about it? The armies of Pakistan were in Kashmir for six months and then they denied the whole thing. When you base a case on a lie, the lie has to be repeated; and it was repeated in the Security Council month after month. Their armies were still in Kashmir and their Foreign Minister went on saying that they were not there. That was an astonishing thing. When the United Nations Commission was here and was on the point of going to the front and when there was no possibility of concealing this fact any longer, they admitted it. They had to admit it and a statement was submitted by the Commander-in-Chief of the Pakistan army who was a well-known British Officer. The statement was to the effect that he had been compelled, in the interests of protecting Pakistan, to send his armies-the Pakistan armies-into Kashmir. He was afraid that India was going to invade Pakistan across Kashmir from somewhere in Central Asia! That was the beginning of the extraordinary story of Kashmir and it is as well that it is repeated again and again, because people are apt to forget it. This matter has become international and is talked about in the various capitals of the world. This simple story, these simple facts of invasion, of brigandage, loot and arson are forgotten and passed over casually while other discussions take place. It has been an amazing education for many of us these five years: education in world politics, education in how nations can behave, education in how great countries get distorted vision and cannot see straight in the simplest matter when it so suits them. Perhaps, I am talking a little beyond my present brief. To come back to the future of Kashmir, I want to stress that it is only the people of Kashmir who can decide the future of Kashmir. It is not that we have merely said that to the United Nations and to the people of Kashmir; it is our convic­tion and one that is borne out by the policy we have pursued, not only in Kashmir but everywhere. Though these five years have meant a lot of trouble and expense and in spite of all we have done, we would 'willingly leave Kashmir if it was made clear to us that the people of Kashmir wanted us to go. However sad we may feel about leaving, we are not going to stay against the wishes of the people. We are not going to impose ourselves on them at the point of the bayonet. Of course, this does not mean that we are prepared to do what we consider wrong if the people of Kashmir should desire it. If they want us to do something wrong in Kashmir, we shall refuse to do it. We may even say, 'We would rather not have any association with Kashmir than have the wrong kind of association.' That is certainly conceivable. Nobody can force on us an association we do not want just as we cannot remain in Kashmir against the will of the people. An association is a matter of mutual understanding and affection, it is a voluntary union of parties who wish to have ties with each other. In our desire to gain the goodwill of the people of Kashmir, we cannot afford to provoke the ill-will of our own people. We are not considering this matter as a bargain or as a matter between strangers. We are almost a part of each other and are considering a difficult and delicate problem together as partners in order to try and find a way out. The way out may not be completely logical; it may not be completely reasonable from the point of view of this law or that constitution; but if it is effective, then it is a good way out. I should like to say one more thing in this connection although it is, perhaps, not to the point. I am afraid of saying it because there are so many lawyers here. When the British left, there was a good deal of misunderstanding about the situation that ,ras created in India by the Partition and because of the statement about the Indian States issued by the United Kingdom. I shall venture to put forward my own view, functioning, for the moment, as a jurist and a constitutional lawyer. The Partition took away a certain part of India with our consent; but the rest of India, including the States, remained as a continuing entity. Till something happened to separate the States from India they were a part of India. We were not created by partition as Pakistan was. India was, India remained, India is, India will be. So, every State, till it arrived at a decision to the contrary, would continue to have the old relationship with India. By the removal of the British power from India in 1947, we were, to some extent, thrown back to the days 'when the British first came. That is an interesting and good parallel to pursue in other ways, too; but I shall not pursue it, because it may lead to controversial matters. When the British power established itself in India, it became evident that no other power in India could remain independent. Of course, these powers could remain semi-independent or as protectorates or in some other subordinate capacity. Accordingly, the Princely States 'were gradually brought under the domain and suzerainty of the British power. Similarly, when the British left India, it was just as impossible for old bits of Indian Territory to remain independent as it had been during their regime. At that time Pakistan was, of course, out of the picture. For the rest, it was inevitable that the princes and others, 'whoever they might be and 'whether they wanted it or not, must acknowledge the suzerainty of the sovereign domain of the Republic of India. Therefore, the fact that Kashmir did not immediately decide whether to accede to Pakistan or to India did not make Kashmir independent for the intervening period. Since she was not independent it was our responsibility as the continuing entity to see that Kashmir's interests were protected. I wish to say this, because it was undeniably our duty to come to Kashmir's aid, irrespective of whether she had acceded to India or not. On account of the continuing entity, India's responsibility to all the other States remained unchanged except in the case of those that had definitely and deliberately parted company. The word 'monarchy' has been used a good deal. I do not understand in what sense it was used. We have no monarchs in India. I understand the meaning of the word 'monarchy' but it does not apply in the present case. I do not know why such words should be employed unless the aim is to delude us. There are some persons who, by the generosity of our States Ministry, are still called 'rulers.' I do not know why, because they rule nobody. Our States Ministry in the last three or four years has been known for its generosity and I am afraid we shall suffer for that generosity for a long time to come. There is no monarchy in India. In certain places there are princely families who have unnecessarily large endowments. They hope to live on these endowments for generations to come. There are also a few Rajpramukhs. At the moment, we have three States that are headed by Rajpramukhs; in some instances, there are groups of States and one of the ex-rulers has been chosen to be Rajpramukh for life. Some of the Rajpramukhs are, undoubtedly, excellent people; others are not quite so excellent. It is true that the idea of giving tenure to a person in a responsible office for life is not entirely in keeping with modern thought. One must remember the particular context of events and not be too critical of what was done. When this step was taken, hundreds and hundreds of States had to be absorbed into India within a few weeks. At that time, a number of princes might well have given a lot of trouble; in fact, some were on the point of giving major trouble. Some did give trouble secretly. When our other troubles came, some of these princes and their families and cousins and uncles did a lot of harm and injury by giving money and guns to gangs of rowdies to go about creating mischief. That was the position: there were hundreds and hundreds of independent States in India, which were uncertain of their future, afraid of their own people, afraid of the Government of India and left in the lurch by the protecting hand of the British power. We could have decided many things at that time. We could have decided, if you like, to remove them completely from the scene or to come to terms with them and buy immediate peace in a moment of grave peril to the country. It is very well for us to be wise after the event but I think Sardar Patel acted very wisely. There was great danger that India might go to pieces under the stress and strain of the passions raised by the Partition, the huge killings all over the country and the communal atrocities. The reactionary jagirdari and feudal elements threw themselves into the picture just to create trouble and disruption and in the hope that they could enlarge their domain in the general confusion. It was foolish of them to hope that; nevertheless, that is how their minds worked. In such circumstances, one had to take a decision. Chiefly Sardar Patel and partly all of us arrived at the decision that it was better to consolidate India rapidly, even though it cost a great deal of money, than to let waste­ful fratricidal warfare and disturbances continue. Apart from other things, even from the point of view of cost, the latter would prove to be more costly in the long run, besides leaving a trail of bitterness. Therefore, we made certain rapid settlements which, financially or otherwise, were hardly fair; but this was the price we had decided to pay for the quick settlement of a very difficult and vital problem. I shall not go into the details of how we propose to deal with these matters in future. Obviously, such matters will have to be dealt with in a friendly spirit because what happens in one place undoubtedly has its reactions and repercussions in another. What is happening or is likely to happen in Kashmir is bound to have its reactions elsewhere. The honourable Dr Mookerjee also referred to Article 352. He said a great deal about it and asked me whether certain other articles dealing with financial chaos or emer­gency and with the breaking down of the Constitution would be applied in this case. I shall answer him. At present, we are not applying those articles. We have not even put them forward for consideration. I would beg the House to remember that we have to proceed on the basis laid down by that stout builder of our nation, Sardar Patel. At the time our new Constitution was being finalized, the question of Kashmir came up and was dealt with in Article 370 of the Constitution. I would ask the hon. Member to read Article 370, because if he discusses this question now, he must do so on the basis of the Article which had been agreed upon and which is a part of the Constitution we have given ourselves. It is true, as has been pointed out, that the Article in question was not a final and absolute provision. That Article itself was a transitional one. But it laid down the method of decision in the future. It laid down the mode of procedure and prescribed the manner in which additions could be made to the subjects. Altogether, there were two classes of subjects. One related to the three major subjects or rather to the three categories of subjects, namely, defence, communications and foreign affairs. If any change was to be made in the inter­pretations of these, the President was to do it in consultation with the Kashmir Government or the Constituent Assembly of Kashmir. In regard to the other subjects, the words used are "with the concurrence of" and not "in consultations with." Why, then, should anybody complain that we are going outside the Constitution, that we or the people or the Govern­ment of Kashmir are committing a breach of the Constitution? It may well be "that the Government of Kashmir will ask us to do something which we do not consider proper. In that case, it only remains for us to talk to each other and find a way which both consider proper. If we fail to arrive at an agreement then, of course, that thing cannot be done and the consequences have to be faced. The consequences may not be agreeable to them or to us but there is no other way. There is no question - as some of the amendments of hon. Members seem to imply - of our issuing some kind of decree or sending a compulsory order. I do submit that we have approached this matter and we shall always approach this matter in a spirit of friendship because we have to remember that there are many aspects to this question, both external and internal. The internal aspect is at present the responsibility of the Kashmir Government. The activities in that part of Kashmir which is called 'Azad' Kashmir - wrongly so, since it is under Pakistan - have an effect on other countries. Foreign countries naturally have an effect on India and so on. There are so many aspects to the problem that you just cannot look at it from your own point of view only. It may be that the people of Kashmir have a particular aspect in view which you have not consider­ed. It is possible that you may be convinced if you consider it. Dr Mookerjee complained that he was not consulted about certain things. Surely, Dr Mookerjee will not expect Sheikh Abdullah or a member of this Government, in the course of important talks to be constantly consulting others. It is impossible; it cannot be done. Apart from those who had a particular commission in connection with this matter, even the members of my Cabinet were consulted only after the talks were over. Sheikh Abdullah was anxious to meet the Members of the Opposition. He did not have the advantage of meeting Dr Mookerjee but he did meet his colleague, Mr Chatterjee, and he had a two-hour talk with him. I was not present at the talk but Mr Chatterjee was good enough to write to me and inform me that he had been influenced by what Sheikh Abdullah had told him. He further said that he now realized that there were many aspects which had not been put before him earlier. I should like to refer to Article 352 which deals with the proclamation of emergency. It reads as follows: "If the President is satisfied that a grave emergency exists whereby the security of India or of a part of the territory thereof is threatened, whether by war or external aggression or internal disturbance, he may, by Proclamation make a declaration to that effect. ... "
In a sense, the President can do all manner of things, including taking charge of the whole State. 'What we suggested and agreed upon in these talks was that where there was a reference to internal disturbances, this action should be taken with the concurrence of the Government concerned and that such concurrence was not necessary in case of aggression or war. Undoubtedly, that is a varia­tion in favour of that Government and hon. Members are entitled to criticize it. Will hon. Members kindly recall the basis from which we started? We start from Article 370 for the present moment. Article 370 rules out Article 352 and all the other articles. That is to say, at the present moment, keeping strictly to the Constitution as it is applicable to Kashmir State, none of these provisions apply. So that, all we have said in regard to the Supreme Court or to the President's other powers, is new and must be included in the Constitution of Kashmir. The supremacy of the President or this Parliament or Supreme Court only applies to Kashmir to the extent to which they accept it. It is not as though we were giving away something. We have very specifically laid down this very important provision of the Constitution, that the President can take charge of the whole State itself under a grave emergency. This should apply to the State of Jammu and Kashmir except in the case of internal disturbance, when the concurrence of the Government of Kashmir is necessary. This seems very odd and some people say, 'How can you ask or wait for their concurrence?' It is not really such an odd provision; because when the whole State is in a chaos, then nobody waits for anybody's concurrence and the necessary steps are taken. The particular phraseology of the Article is taken from the American Constitution, where the Federal Government can take charge of the State in an emergency with the concurrence of the State Government. Undoubtedly, it is open to hon. Members to criticize this; but there is nothing very odd or very special about it and, in the circumstances, we felt that it was better for us to accept this form rather than none. The fact that we have been considering these provisions, whether they are emergency provisions or they concern the President's special powers or Parliament's powers in a certain domain or the Supreme Court, is surely an indication as to where sovereignty lies. I am, perhaps, being rash; but I am talking about the Constitution and legal matters. Obviously, in a federal constitution, federal sovereignty is divided between the Federal Centre and the States. In a moment of crisis, however, sovereignty may vest with the Federation or Centre. I see that the Law Minister apparently does not agree. I am not quite sure but whatever the case, it is a small matter. Whether sovereignty is to be divided or not in a Federation is an old argument. I started with the presumption that it is for the people of Kashmir to decide their own future. We will not compel them. In that sense, the people of Kashmir are sovereign. They are not sovereign in the sense that they cannot accept the Constitution and then break it. They cannot enter into a partnership with us and accept that part of our Constitution over which we are sovereign and then try to evade it. But they are sovereign in the sense that they may accept the whole or reject the whole; or they may come to an agreement with us on particular matters that they do not want to accept along with our Constitution. I have taken a lot of time and I hope the House will forgive me for it. In a few days, my colleague, Mr Gopalaswamy Ayyangar, will be leaving for Geneva. I will not be very truthful if I say that I expect great things to happen; but we have to carry on with the rough and the smooth of it and not run away from it. Our good wishes go with him but, above all, our good wishes should go to the people of Jammu and Kashmir State, who have become the plaything of international politics and even of our debates.